As I was updating my records this morning with yesterday's changes in the Tallahassee real estate market, I noticed that the Tallahassee MLS recorded 27 new contracts yesterday. To put that into perspective, we had been averaging just under six per day thus far in May. More importantly, it was the single most active day for new contracts since 28 were posted on October 4th, 2013. So why is this so big a deal? The real estate graph below shows the total number of new contracts in the Tallahassee MLS each month from January 2012 to present. Even without a trend line, it is obvious that buyer activity has been declining dramatically this year. If you look at the two orange vertical markers, you can see just how much more activity was recorded in May of 2013 and May 2012. 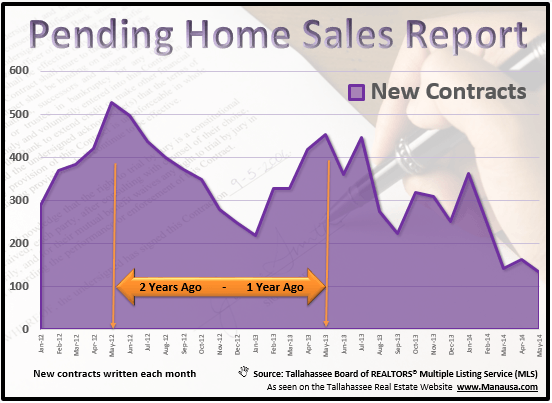 Long time readers of the Tallahassee Real Estate Blog know that this is a concern for the housing market that we have written about in the past, and we are a bit perplexed about the causation of such a negative trend (greater than 50% decline!). But does yesterday somehow reveal the start of vigorous buying activity? There are more homes entering the market right now than we have seen during the past three years. Coupled with the decline in homebuyer activity (new contracts), you can imagine that we are becoming concerned with rising inventory levels. The past three years has seen a welcome reduction in the glut of homes for sale in Tallahassee, but we need to see the trend continue for the health of the market overall. The following is a continually updated roster of the 20 most recently listed properties, priced over $100,000 in Tallahassee. If you would like to know more about the best buys and newest listings in the Tallahassee MLS, just drop me a note and we can schedule a time to review your needs and wants and direct you to the best opportunities in Tallahassee.